Location: On the west side of Station Road. Cherry Vale now runs through the station site. 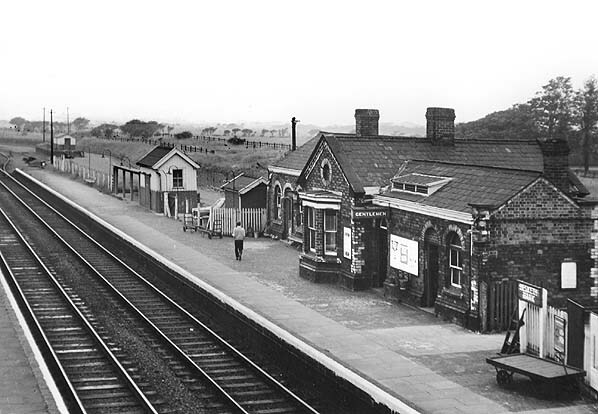 Hesketh Bank station was on the West Lancashire Railway (WLR) Company’s Southport & Preston Railway which opened in stages between 19 February 1878 and 6 September 1882. The WLR was promoted by Sir Thomas George Fermor-Hesketh, Bart. Royal Assent was given for the ‘West Lancashire Railway’ on 14 August 1871. The Act authorised construction capital amounting to £150,000. James Brunlees and Charles Douglas Fox were appointed as civil engineers, and the contract for construction was let to Clarke Pruchard and Co. The first sod was cut at a special ceremony held at Little London, in Southport, attended by the Mayor, Alderman Squire JP, on 18 April 1873. From the start the WLR project struggled financially and, although construction started successfully, it stopped abruptly when the contractor faced financial difficulties. A further WLR Act of 1875 authorised the raising of a further £187,500 and granted an extension of time for the line’s completion. A new contractor, Barnes & Squire, was appointed, and work resumed. station had two platforms. The main building was a single-storey brick structure on the down (what would later be the Preston-direction) platform. The building was similar to those at other stations on the line, such as Longton Bridge, but was a larger version that was also used at Hesketh Park. The central section was a ridge-roofed structure aligned with a gable facing the platform where there was a canted bay. Wings, with round-headed door and window openings, extended on both sides. The up (Southport-direction) platform had a brick-built, enclosed waiting shelter. Wooden stairways led to each platform from Station Road, at the eastern end of the station. There was also a driveway to the main station building. station, was a siding that led through a turntable into a single-road engine shed which opened 19 February 1878. Hesketh Bank signal box, erected by McKenzie and Holland, controlled both the goods yard on the down side and the engine shed siding on the up side. It had 13 levers and was on the up side, adjacent to the engine shed siding and opposite the entrance to the goods yard. At the time of opening Hesketh Bank was the northern terminus for trains to and from Hesketh Park, but on 10 June 1878 the line was extended southwards to Southport Windsor Road. On 1 August 1878 the line was extended a short distance eastwards to the banks of the River Douglas. 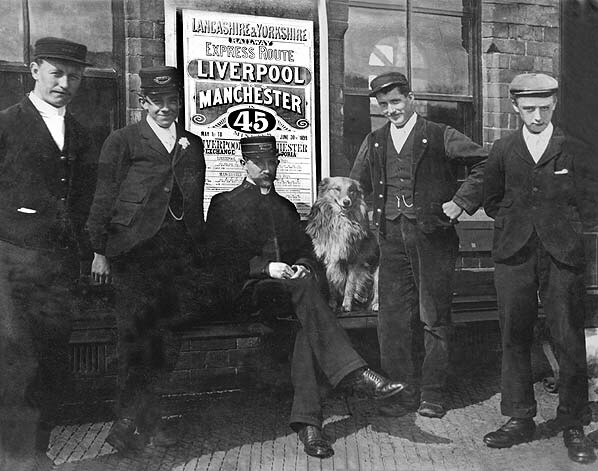 A station was opened adjacent to the river’s west bank, from where the WLR operated a steamship service to Lytham St Annes. It was operated by the WLR-owned paddle steamer Virginia,and trains would have run eastwards beyond Hesketh Bank only to connect with steamboat services. In 1880 a 1¼-mile goods branch opened from Hesketh Bank to Tarleton, from a junction with the main line on the eastern side of the Station Road bridge. It was controlled by the River Douglas signal box and curved southwards from the WLR line. Its terminus was at Tarleton, adjacent to the Leeds & Liverpool Canal’s Tarleton branch. By 1882 the station was being referred to as Hesketh Bank for Tarleton. with the line’s northward extension, it was also extended at the southern end into the new Southport Central station. The engine shed closed on 18 May 1882 when Preston shed opened. It may have been used after that date to house the house the Tarleton branch loco but had been demolished by 1893. Bradshaw of December 1895 showed 14 departures from Hesketh Bank to Preston on weekdays, the first at 7:02 am. Four of the trains (but only two on Thursdays) continued to Blackburn. There were 16 weekday departures for Southport Central, the first at 6:32 am. The station even had a Sunday service at this time with six services in each direction. On 1 July 1897 the Lancashire & Yorkshire Railway (LYR) took over the WLR. From 16 July 1900 the LYR closed the WLR Preston station and diverted trains into Preston’s main line station. From 1 May 1901 they closed Southport Central and transferred WLR line trains to the Southport Chapel Street terminus. On 3 June 1912 the LYR introduced a ‘railmotor’ service between Crossens and Tarleton Halt, calling at Hesketh Bank - which lost the ‘for Tarleton’ suffix, although it appears to have been discontinued in company timetables from 1899. The railmotor was not a success and was withdrawn on 1 October 1913. A 1918 signalling diagram showed that the goods yard facilities had been altered with the original cattle-pen being converted into a large goods loading wharf. A new horse and cattle loading dock was provided further west in the yard. On 1 January 1922 the LYR was absorbed by the London & North Western Railway but a year later that company became part of the London Midland & Scottish Railway (LMS). By summer 1932 Hesketh Bank had 17 weekday services to Southport and 16 to Preston. It also had one train to Todmorden, a train to Accrington and another to the ‘East Lancashire District’. The first departure was for Southport at 6:08 am. The last was also for Southport at 10:57 pm. There was a Sunday service at this time with six trains running to Preston and five to Southport. controlled a new ground frame at the Alty Brickworks siding, which had previously been controlled by the River Douglas box. On 1 January 1948 Hesketh Bank became part of the nationalised British Railways (London Midland Region). By winter 1956/7 there were 21 weekday Preston services and 23 for Southport. The first and last departures were for Preston at 6:07 am and at 10:55 pm. Hesketh Bank continued to be served by trains on Sundays with six to Preston and five to Southport. Whereas the LMR installed modern ‘totem’ signage at Banks and stations southwards, the remaining stations, including Hesketh Bank were not modernised, suggesting that their future was not secure. However Hesketh Bank had electric lighting installed in its later years, unlike other stations at the Preston-end of the line. Indeed in July 1959 Railway Magazine reported that the LMR was considering closure to all traffic of the route between Crossens – the terminus of the electric service – and Preston before the end of the year. by 1964, and it closed officially on 30 April of that year. 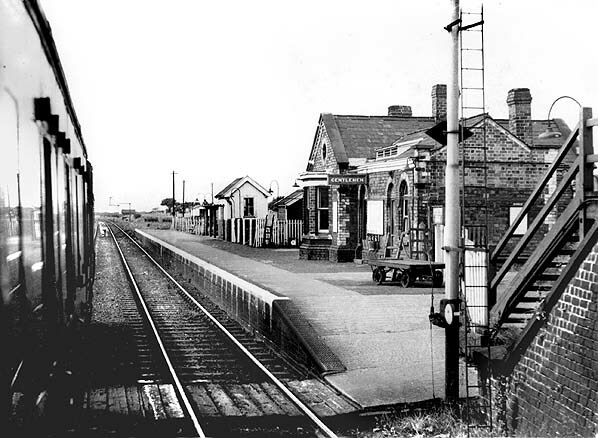 Despite local protests the passenger service was withdrawn with effect from 7 September 1964, and the line from Hesketh Park to Preston closed completely. Track-lifting trains passed through Hesketh Bank station and ran up to the River Douglas bridge in the months following closure. The line was lifted in stages back towards Southport, and rails through the station were removed in February 1965. The station was demolished around the same time. 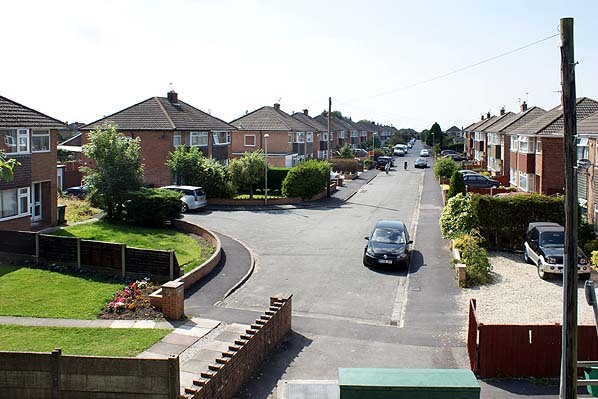 It was later developed as a residential area. Tickets from Alan Castle except 2479 Michael Stewart, route map drawn by Alan Young, Bradshaw from Chris Totty. 1893 1:2,500 OS map. This map shows Hesketh Bank station as it was while still under the ownership of the WLR. 1931 1:2,500 OS map. 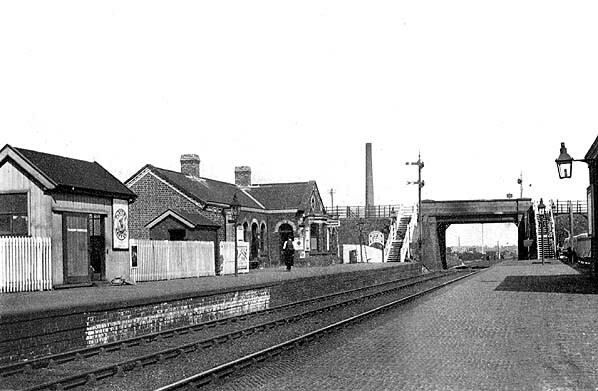 Relatively little had changed at Hesketh Bank station between 1893 and 1931 although housing had been developed close-by, bringing extra revenue. Hesketh Bank became one of the busier stations on the former WLR line. Hesketh Bank station looking east from the up (Southport-bound) platform c.1905. The day was probably a Sunday, and the occasion a trip to Southport. The passengers are dressed in their finest clothes which was the norm for days-out during that period. 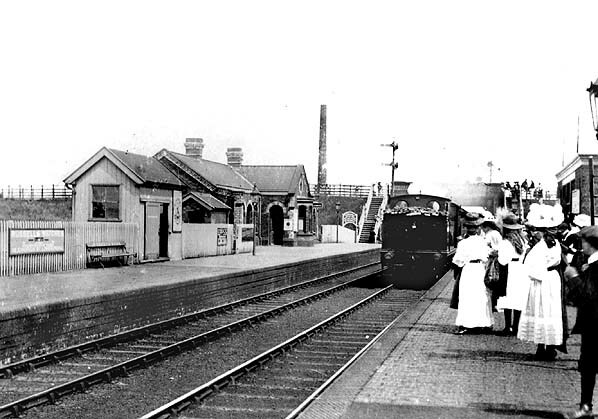 Hesketh Bank station looking east c.1910. The photographer had caught the station at a quiet time. 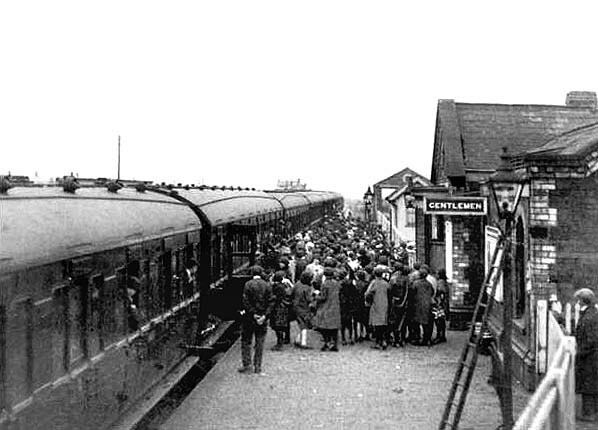 A crowded scene at Hesketh Bank station in the inter-war years. Hundreds of children prepare to join a train heading towards Preston, possibly on a Sunday School outing. 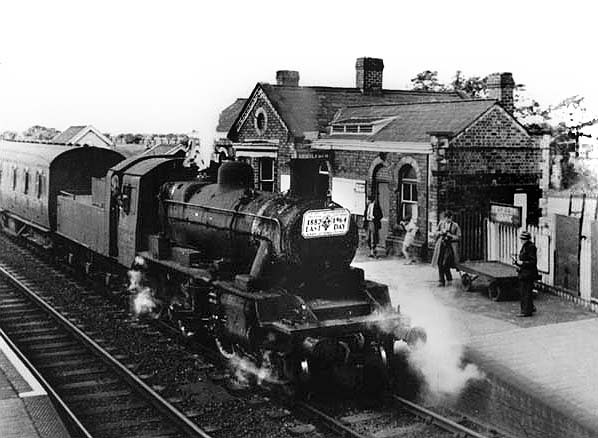 A Preston to Southport Chapel Street train arrives at Hesketh Bank’s up (Southport-bound) platform in 1950. The station appears busy with a number of passengers waiting to board the Southport service, whilst on the down platform a heavily loaded trolley is dragged towards the main building by one of the station staff. The chimney seen in the distance to the left was part of a brickworks. 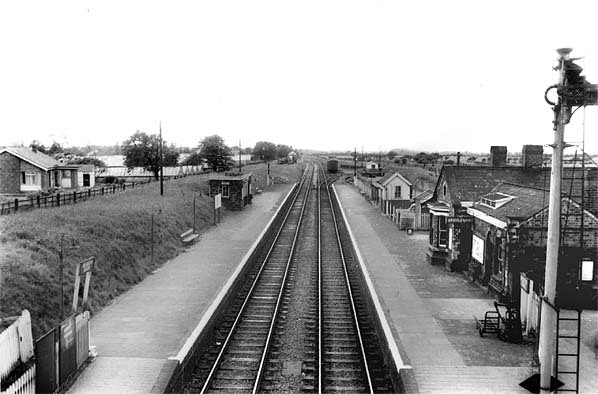 Hesketh Bank station’s down platform and main building are seen from the Station Road bridge, looking north-west in 1963. The 1:16 pm Preston - Southport draws into Hesketh Bank station on 16 August 1964. The northbound platform is empty for now, as the 1:17 pm Southport - Preston has departed three or four minutes previously. Although the goods yard sidings beyond appear to be disused - freight services having been withdrawn about five months before - at least four platform barrows of various types suggest that the booking office is still conducting a fairly brisk trade in parcels and perishables despatched by passenger train. After closure, the station and yard sites are soon to be demolished to provide land for yet another housing estate. Apart from the bridge at this point, under the main road through the village, there will soon be no evidence that a railway ever ran here. 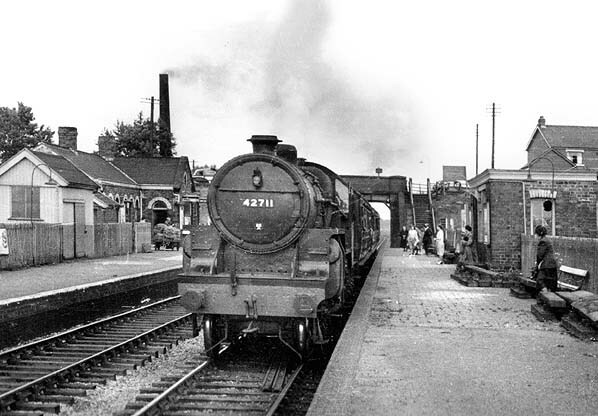 A Preston service departs from Hesketh Bank station on the last day, 5 September 1964. The site of Hesketh Bank station looking west from Station Road in July 2011. The road leading away into the background follows the route of the WLR trackbed. The residential area was built in the 1970s.